Tonight is your last chance to enter the secret phrase before maintenance starts. The previous ARKS Unity Festival post will be updated and bumped to the top to include the upcoming Valentine’s Bingo and event information. 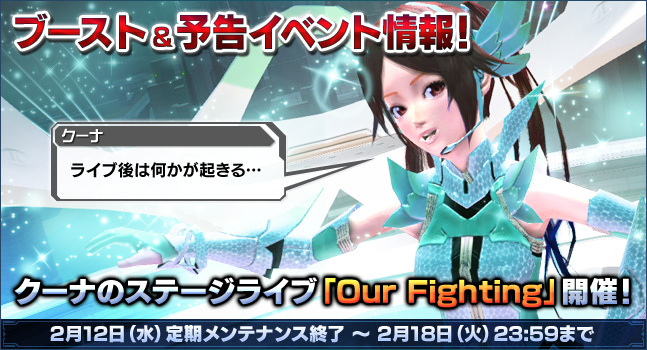 PSO2 Blog wrote about the storage space dilemma. Electifinis Weapon Camo’s volume has been adjusted. Corrected a bug wherein under certain environments, some characters weren’t displaying correctly (or appearing white) on the screen. Corrected a bug where some items were displaying out of their natural positions in the preview window. Corrected a bug where under certain conditions, partners were using photon arts that weren’t set on them. Corrected a bug where partners would fire Na Foie at their feet. This week’s boost event and campaign information will be posted during and after maintenance. Please note, Raging Dark Arms (Lv. 70 Dark Falz), appears 30 minutes after Quna’s concert! The links within this table automatically convert into your timezone. Lv 70. Falz appears 30 minutes after every live concert. A rare drop boost event will be applied to all ‘Super Falz’ quests scheduled in the tables above. Boost event applies 0:00 ~ 23:59 JST on the appointed day. Spend the qualifying amounts of AC during the campaign period to get special prizes! After 2.12th’s maintenance through 3.12th’s maintenance. *Note: Merely using the AC Scratch tickets contained in the bundle does not qualify you for this campaign. As long as AC is spent when purchasing the ticket bundle qualifies you for the campaign. Late March at the Visiphone. During the campaign period, create a new character and level them up passed 10 to receive various prizes. Characters created prior to the start of this campaign do not qualify. Even if several characters satisfy these conditions, you will only receive the presents once per account. Now until Maintenance on 2.26.